Home / Fashion / Fashion blogger / long chaambray vest / long vest / personal style / STYLE / style4less / STYLE4LESS SHOWS US 2 WAYS TO STYLE A LONG LINE CHAMBRAY VEST. STYLE4LESS SHOWS US 2 WAYS TO STYLE A LONG LINE CHAMBRAY VEST. STYLE4LESS also known as Olawunmi Salako, ni fashion blogger who aims to show the world kwamba you do not have to spend a lot of money to look good, unaweza kununua a simple things and still look like a million bucks, all depends on hown you decide to style it up. 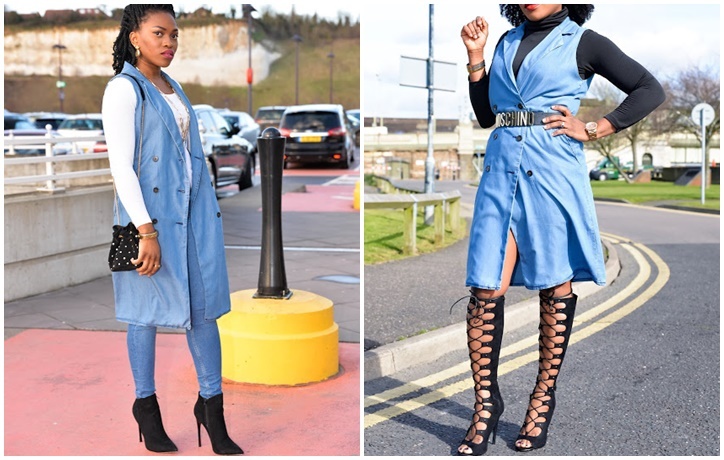 So Olawunmi has styled this forever 21 long line chambray vest in two ways as a vest na as a dress..
Amevaa the vest na kuifunga all the way, amevaa ndani a black long sleeve t-shirt, she also addea a Moschino inspired belt, and ooh those knee-high laced boots. Amevaa a white long sleeve t-shirt with a tight denim jeans and black ankle boots, then katupia the vest kwa juu.